George Macdonald said, ‘If you knew what God knows about death you would clap your listless hands’, but instead I find old people in North America just buying this whole youth obsession. I think growing older is a wonderful privilege. I want to learn to glorify God in every stage of my life. Tim often tells me “I have a hole in my heart the shape of your figure.” To Tim, I am beautiful. But, when I look in the mirror, I see every flaw. It is so easy for me to get sucked into a worldly view of beauty without even realizing it. While God is working to make me someone truly beautiful, from the inside out, for His glory (not mine), He has given me wonderful examples of beauty that touch me to the depths of my soul. Please let me introduce to you my dear friend Rayetta. Rayetta is known for being a vibrant, successful Mary Kay representative (she earned a pink car! ), a committed Christian, a concerned and involved citizen, always dressed to the hilt with perfect accessories, so gorgeous that anyone would take a second glance at her. But, her outward beauty would mean nothing without her inner beauty shining through: her posture reflects confidence in God, while her radiant smile and bubbly laughter springs up like a shimmering fountain, spilling Jesus onto everyone she meets. Her loving arms and open heart have welcomed hundreds of exchange students from around the world into her home. She not only believes in God, she LIVES with Him and for Him. She is one of the most beautiful women I’ve ever met. Last night, however, physically speaking, the woman I saw was a shadow of the Rayetta I once knew. You see, my 65-year-old friend was recently told by her doctors that her earthly life will end in a matter of days, weeks or just a couple months. 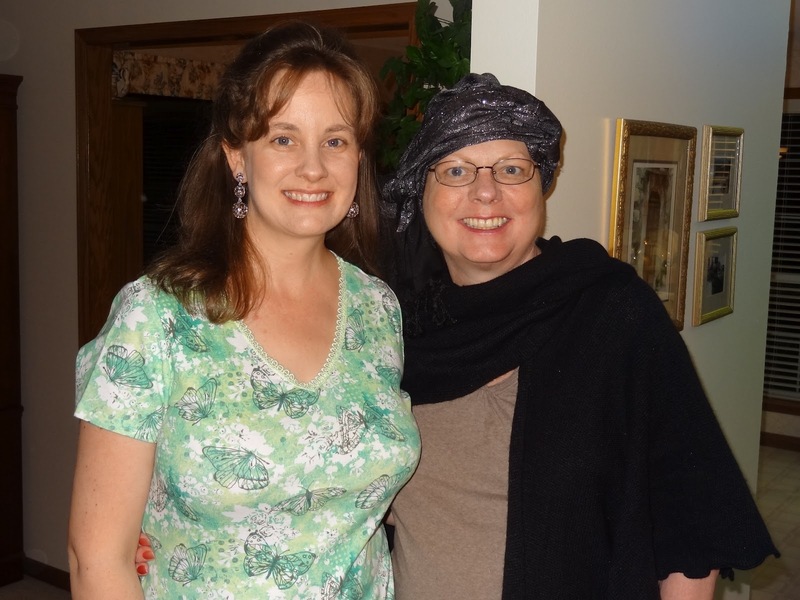 After an on-off fight which began years ago with breast cancer, she now has tumors over-taking her brain. We pray for healing, but we are prepared to let her go to be with God. The picture above is worth a thousand words … love shines through her cloudy eyes … she looks peaceful under her pretty scarf … her still adorable, warm quivering smile speaks, “I’m so glad to be here with you!” Every word is thankful, others-focused. Rayetta’s unquenchable faith in God and assurance of Heaven radiates from her words of praise and thanks to God, for loving friends and a Savior who took her sins upon Himself at the cross. Rayetta is more beautiful than ever! During your pedicure thank God for your feet and ask Him how He can use them to take you places to minister in His name. True beauty is Christlikeness. Look in the Bible to find the clearest mirror of all. Through it God will reveal what you need to change in your life. He wants to help you become less focused on self and more dependent on Him. The more you know and appreciate God, the more beautiful you will become. I look forward to my heavenly glorified body! It will be so restful not to have to worry about calories and cellulite. But, I am absolutely certain that when I am in the presence of my beautiful Savior, I will be in awe of Him – nothing else will matter.